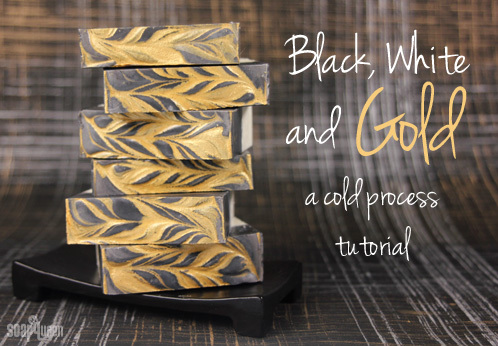 If you’ve never made Cold Process soap before, check out our FREE four part SoapQueen.tv series on Cold Process Soapmaking, especially the episode on lye safety. Bramble Berry also carries a wide range of books on the topic, including Soap Crafting. You can also checkout the digital downloads. SAFETY FIRST: Suit up for safety! That includes goggles, gloves and long sleeves. Make sure kids, pets, and other distractions and tripping hazards are out of the house or don’t have access to your soaping space. Always soap in a well-ventilated area. COLOR PREP: Mix 1 teaspoon of Titanium Dioxide into 1 tablespoon of a light liquid oil, like sweet almond or sunflower oil. 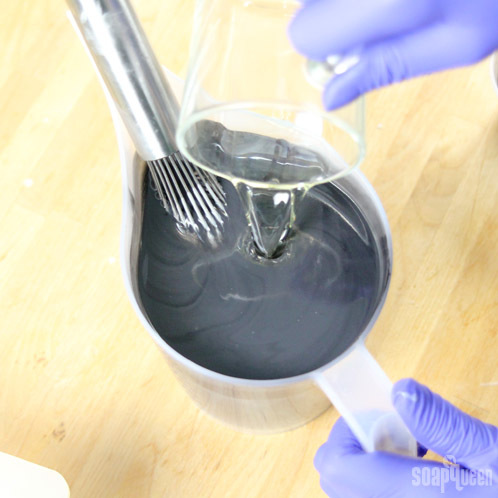 Then, mix 1 teaspoon Black Oxide into 1 tablespoon of light liquid oil. Next, mix 2 teaspoons of Sparkle Gold Mica into 1 tablespoon of the oil. 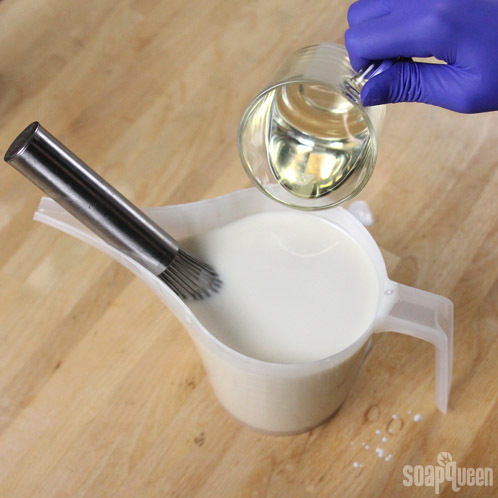 Use a mini mixer to combine the colorant and oil until it’s smooth and there are no clumps. 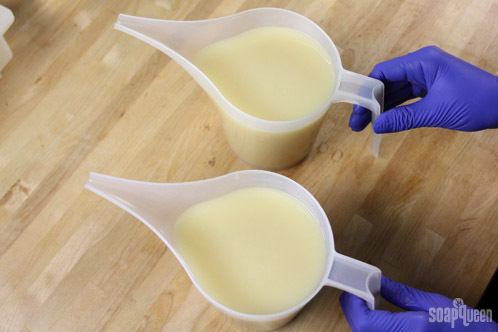 EXTRACT PREP: The bamboo extract will be easier to mix into your soap if it’s dispersed in a light liquid oil first. 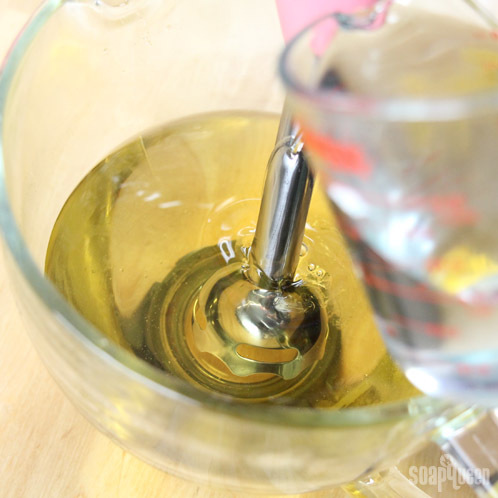 Mix 1 tablespoon of the extract into 2 teaspoons of oil. Combine the two using a mini mixer. ONE: Carefully and slowly add the lye to the water and stir until the lye is fully dissolved and the liquid is completely clear. Set the lye and water aside to cool. 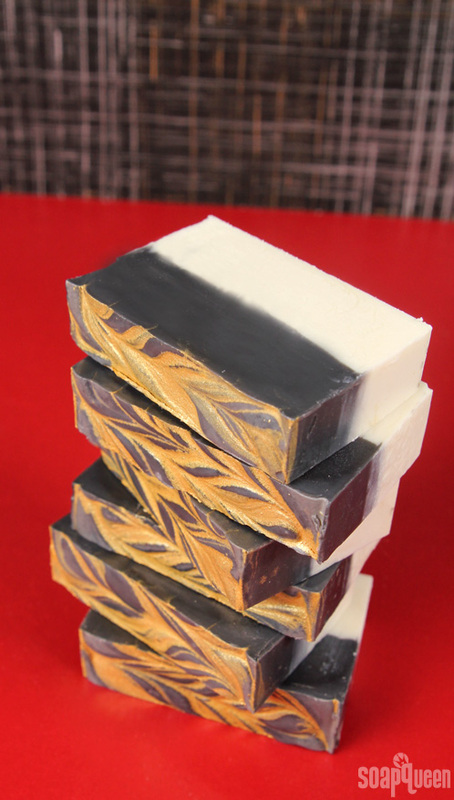 TWO: Combine the canola, avocado, coconut, shea butter and palm oils. Remember to fully melt and mix your entire container of palm oil before adding it to the mixture. Once the oils and lye water have cooled to 120 degrees or below (and ideally within 10 degrees of each other), add the lye water to the oils. Stick blend until you reach medium trace. 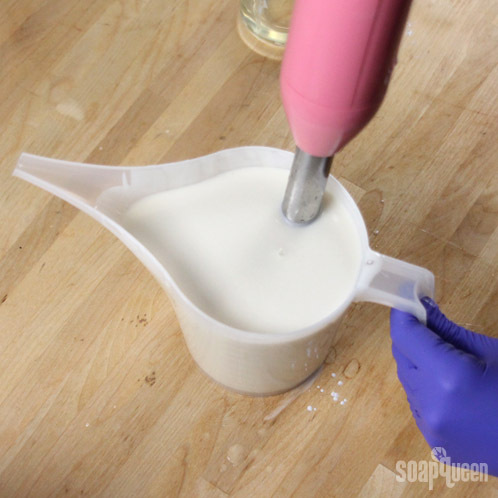 If you want a harder bar of soap that releases faster from the mold, add sodium lactate to your cooled lye water. Add 1 teaspoon of sodium lactate per pound of oils in the recipe. Note: The Titanium Dioxide can cause glycerin rivers. To prevent rivers, you may want to soap with your lye around 100 degrees F, and your oils around 90 degrees F.
THREE: When the soap is at a medium trace, split it evenly into two containers. FOUR: To one of the containers, add 2 teaspoons of the dispersed Titanium Dioxide and 1 tablespoon of the bamboo extract dispersion. Use a whisk to fully combine. FIVE: Add about half the fragrance oil and mix with a whisk. SIX: To make the layer thick enough to support the second layer, stick blend the soap on short bursts for 15-20 seconds until it reaches thick trace. SEVEN: Pour the white soap into the mold. EIGHT: In the second container, add 1 teaspoon of the Black Oxide dispersion and the rest of the fragrance oil. Mix well. 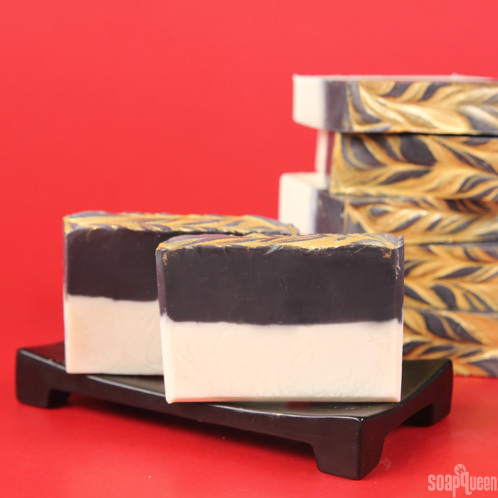 You want this layer to be thinner so it pours easily over the white soap. 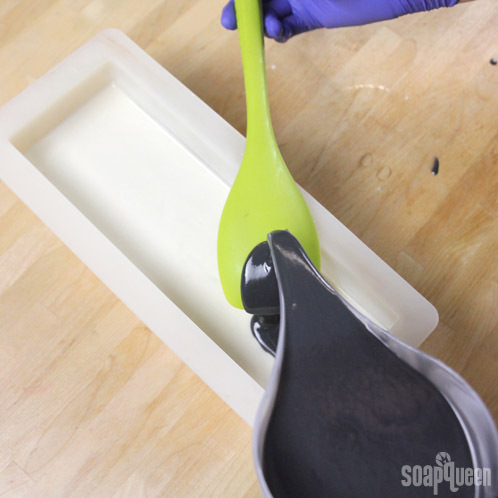 NINE: Pour the black soap over a spatula or spoon. That way it won’t break through the white layer. Pour slowly to prevent any soap from breaking through. TEN: Smooth the soap out. 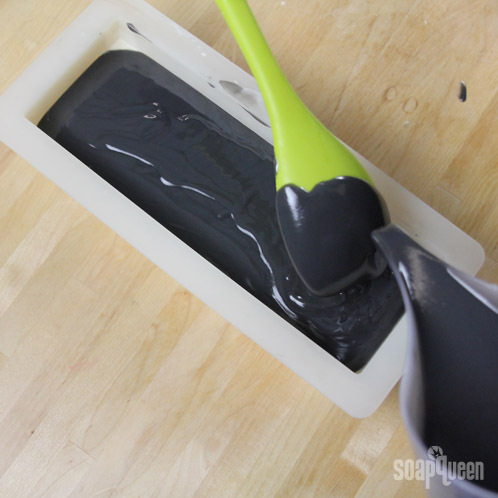 We used a Square Silicone Spoon. ELEVEN: With a dropper, drizzle an S-shaped curve of dispersed Gold Sparkle Mica on top of your black layer (top right and left photos). Next, drag a chopstick or dowel in an S-shaped pattern lengthwise across the soap (bottom left photo). 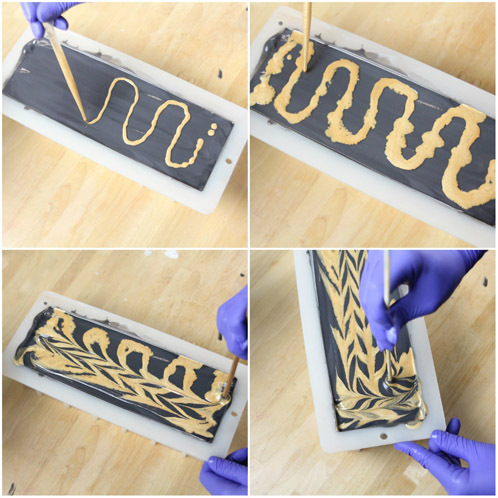 Finish the pattern by drawing the same S-curve widthwise through the soap (bottom right photo). 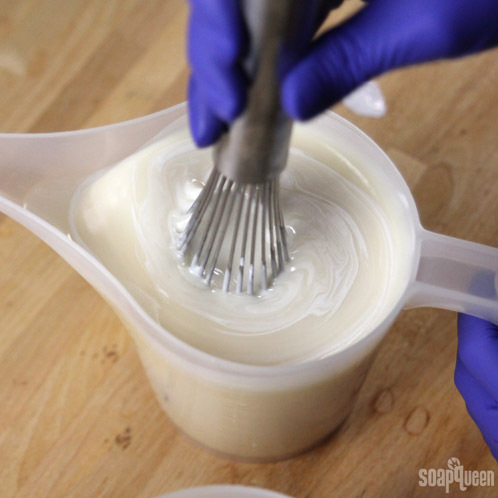 To prevent glycerin rivers, put the soap in the freezer for about 1-2 hours. 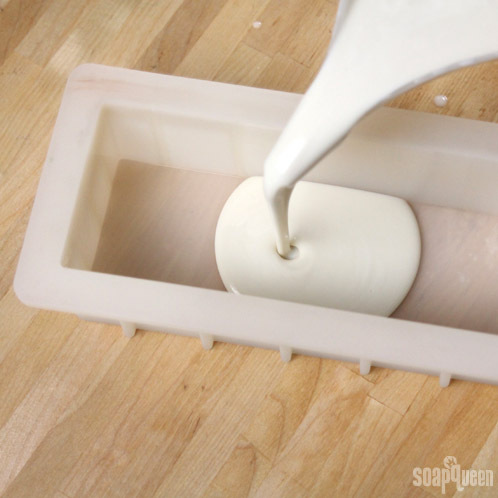 Remove the soap and let it sit in the mold for 3-4 days. 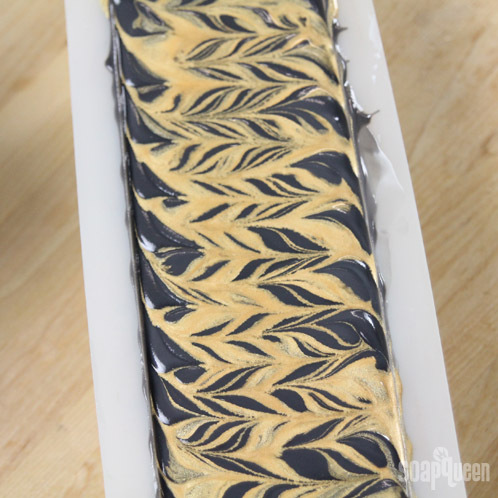 When you cut the soap, flip it over so the mica design is facing down to prevent drag marks. Allow it to cure for 4-6 weeks. Enjoy!